During the German Spring Offensive of 1918, Paris was shelled by artillery from 75 miles away. This was in an age when a conventional cannon's range was 25 to 30 miles. The physical damage was minimal, but the psychological effect was devastating. When these guns fired their 250-pound shells, which reached a height of 25 miles, the curvature of the Earth had to be considered. Despite General Pershing's disappointment with Boilerplate's performance during the punitive expedition against Pancho Villa, he requisitioned the mechanical soldier for a special sabotage mission against what was thought to be only one cannon. Boilerplate covertly traveled to the forest of Coucy near Laon, where it succesfully spiked one of what turned out to be three cannons. Before the metal man’s work was discovered, the Germans attempted to fire the sabotaged weapon, resulting in an explosion that killed most of its 17-man crew. Above left: Paris is shelled from German positions more than 70 miles away. Right: Boilerplate during the St. Mihiel Campaign, September 1918. Within a month, the mechanical soldier would be missing in action. 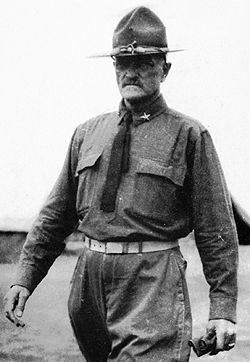 When the American First Army became official on August 10, 1918, Boilerplate was attached to Pershing’s staff and functioning in a variety of roles. The metal soldier participated in the St. Mihiel campaign in September and was to take part in the Meuse-Argonne campaign in October. On October 2, 1918, General Pershing ordered the U.S. 77th Division to advance through the Argonne forest--"no matter what our casualties are." A mixed battalion of about 550 men under Major Whittlesey proceeded toward the Charlevaux Valley, encountering light resistance. They reached a defensible position by evening and dug in for the night. In the dense forest and incessant rain, German units managed to encircle the U.S. force and effectivly cut them off from any relief. In the following days, Pershing had the 50th Aero Squadron attempt an air-drop of supplies. The mission ended in failure: the planes were either shot down, or their packages captured or lost. By October 5, the "Lost Battalion," as it was being called by the press, was without food or water. The next day, Pershing had Boilerplate loaded with as much supplies as it could carry. Its mission was to break through the German lines, pinpoint the exact location of the American troops, and deliver the supplies. The metal man returned after its successful mission, then, on October 7, participated in an assault that relieved the Lost Battalion. During that action, Boilerplate vanished without a trace. Weather and terrain made it easy to lose track of the soldier next to you, so the absence of the mechanical man was not noticed until that evening. It was initially thought that Boilerplate was destroyed by a German artillery shell; however, even a direct hit would have left fragments, and in the weeks to come no pieces of the mechanical soldier were found. Inevitably, Boilerplate "sightings" occurred for decades thereafter--often in Chicago, where it was first unveiled. "Certain secret documents have given me clues about the later history of Boilerplate, beginning with his mysterious disappearance in WWI. It seems clear he was spirited off by German scientists who took him apart and studied his secrets. As proof, just look at the advanced state of their industries only 20 years later. Surely a nation that was beaten and disarmed in 1918 couldn't have built the first guided rockets and jet airplanes without a boost. And where did that boost come from? Boilerplate Technology." 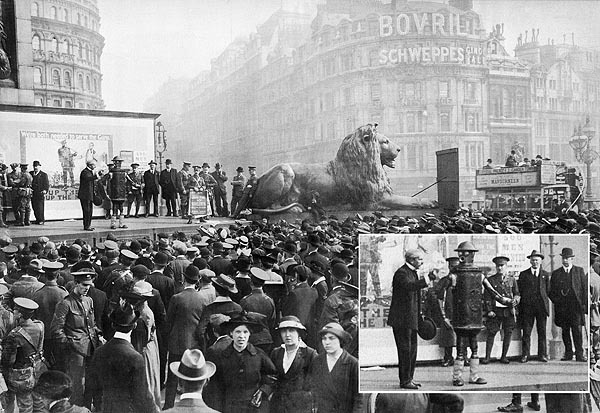 Campion and his marvel sell war bonds in Trafalgar Square, London, 1918. Here's a favorite anecdote about Boilerplate during World War One. "My grandfather's life was saved by Boilerplate. He told us he came up on deck during a troopship Atlantic crossing (he was 17 at the time, and had lied about his age) A large wave swept over the deck, knocking him over and sliding him toward the scuppers. Suddenly, a large arm popped out of a sentry box that had been fastened to the deck. My grandfather grabbed the arm, and, as he described it, "A large metal goop, with feet like canoes, pulled me to safety". The metal man was too tall to easily go into the crowded, narrow confines of the ship, and so a shelter was set up on deck to protect him from the weather. The officers of the ship argued that Boilerplate wasn't an officer, and refused to allow his shelter space in "officer's country". Gramps said it was the only time he ever saw any good come out of the rigid class system in the military. He noticed Boilerplate's feet were covered with rough burlap, this was done to prevent him from scarring up the deck. When Boilerplate left the ship, the padding was removed, my grandfather used a scrap of it to pad his kit bag." Read history buff Alejandro Sergio Marí's detailed response to Boilerplate's mission to destroy the German guns mentioned at the top of this page. Pictured at left is John Pershing in 1917. His and Boilerplate's military histories cross paths on three occasions over a period of 20 years. Pershing first saw Boilerplate in action Scott Loupinduring the assault on San Juan Heights in the Spanish-American War. "Black Jack" Pershing, then a lieutenant, commanded the black cavalry units that supported the Rough Riders' famous charge. In 1916 Pershing attempted to use Boilerplate in special reconnaissance operations against Pancho Villa in northern Mexico. The missions were apparently unsuccessful. 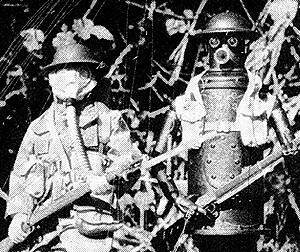 The General recruited the mechanical soldier two years later for operations in the "war to end all wars."